Kind of a cold day, and half the square under construction for the ice-rink. I just read an editorial in the Downtowner, and someone was complaining about the ugly architecture of Via Vite. I think it is OK. It doesn't bother me as much as I think it does others. The trees over time will soften it. Yes, it looks a little industrial & "exhaust vent" like ... but given cost, structural issues of building over the garage entrance and an existing parking structure, etc. it is ok. 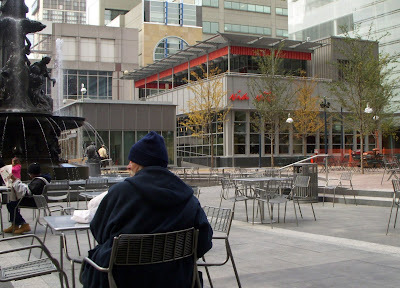 Bet its the same guy with the placard protesting that the Fountain Square is a 3CDC failure.